Hi Friends! Today I’m popping in to share an old post I updated the photos for! I’m keeping most of the original text because I think it’s a good topic for this time of year! I hope you enjoy it, I’ve been waiting for any excuse to make these cookies and update the photos, they are very near and dear to my heart! This recipe is by no means healthy, it isn’t even an attempt at a healthy (well except for the oatmeal and peanut butter). That brings me to something I’ve been wanting to discuss on this blog for quite some time now. What is healthy? When it comes to food, I think the true definition is broader than the word implies. When we eat we fuel our bodies with nutrients to keep us going. We provide energy for our organs to function, to do our daily activities, to work, to exercise and whatever else we got going on. Then sometimes we need to feed our souls. I get mad when I think about all the times that I avoided eating out when I was Calorie Counting because I was afraid that I wouldn’t stay within my ridiculous 1200 calorie limits. Or I would skip meals to be able to indulge in dessert. THIS IS NO WAY TO LIVE, it causes emotional and physical stress on the body. No bueno, not healthy. Since I let go of calorie counting, I’ve learned to feed my body and my soul. I feed my soul with ’s cookies as much as possible, and while I enjoy them I’m filled with all kinds of warm fuzzy memories. These delicious, no-bake cookies are based on a handed down family recipe from generation to generation, just like the good old days. As a kid, my favorite part of these was licking the giant spoon used for stirring them. As an adult, I still lick the spoon (and scrap the pot) but now I really appreciate the convenience of how quickly these ones together. Now Grandma’s recipe comes from somewhere in the South which means sugar and butter are the primary ingredients. What is funny is, even though they swear it is the same recipe I always remember hers being harder like fudge. I remember my Mom’s being super peanut buttery. Now, I’ve spent MANY enjoyable trial and error batches trying to make my own signature cookie. I use about half the sugar from the “original” recipe which yields a chewier cookie. Mostly because I just can’t bring myself to dumb that second cup of crack into the batch. However, the thing is, my grandma used to spread the mixture over a cookie sheet so we ate much smaller pieces, like fudge or candy instead of cookies. If you want that, do it, OMG then I’ll come steal it from you since I don’t have the cajones to drop in two cups of sugar myself. I also use almond milk because that’s what I usually have in the fridge. 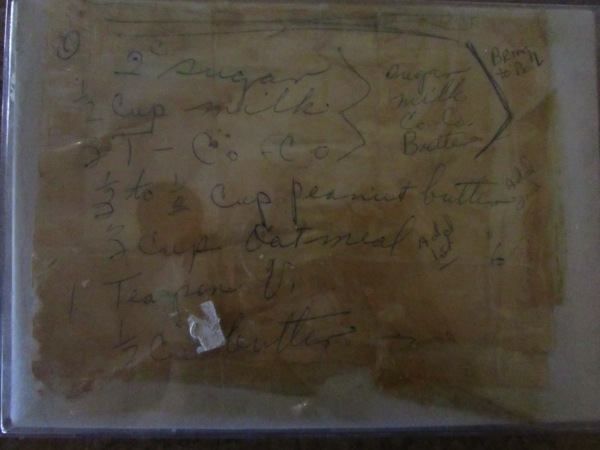 Lastly, I swapped the Jiffy normally found in my childhood cabinets, for natural peanut butter. You guys know how I feel about hydrogenated peanut butter. Grease a dish or pan with butter and set aside. Bring butter, milk, cocoa, and sugar to a boil. Remove from heat and add in oats stirring well. Quickly stir in the peanut butter and mix until well combined. Pour into a cookie sheet or casserole dish (8x8) and spread evenly around. For chocolate icing (optional): melt down chocolate chips in the microwave (chocolate chips plus 1T milk), spoon into a ziplock bag and cut of the tip. Pipe the design over the bars. You could also just spoon it over the mixture before putting it in the fridge to create a hard iced topping. Set in the fridge to harden for at least 4 hours. Best to freeze them for an hour or so before transporting so they are perfect when you get there! Do you have any handed down family recipes? Whats your favorite way to feed your soul? um. wow. Your grandma knew where it was AT. Isn’t it crazy to think that we used to abide by the 1200 calories a day thing? Um, I double that now. Simply ridiculous. These look awesome lovely! I am totally down for anything no bake these days sans kitchen 🙂 lol! Happy holidays to you and your family!